Transit levels are necessary for identifying contours in the land and surface area used for buildings and construction projects. Builders, architects, civil engineers, and everyday homeowners all use transit levels to measure their work. Specifically, a transit level is a type of optical instrument (such as a telescope) with a built-in leveling tool (like a graduated vial) and base. Workers use transit levels for surveying, building, and finalizing their construction and engineering plans. Transit levels identify the sites on land that need to be evened out or “level off” prior to erecting a building, bridge, or any other type of construction. A transit level is important for checking grades, leveling, and turning angles. The reason you need a transit level (in addition to a standard builder’s level) is that transit levels take more accurate vertical measurements (also known as plumbing or plumb measurements). Whereas a builder’s level focuses primarily on flat or horizontal measurements, a transit level can help provide a more accurate picture with vertical angles. Foremost, transit levels help prevent serious measurement errors in construction. This can help prevent long-term problems (like foundation damage). In this way, the tool may help you save money in the long run. Automatic – Also known as “self-leveling,” the purpose of an automatic transit level is to remain accurate and level regardless of ground vibration, environmental changes, or rough handling. While traditional instruments use graduated leveling vials that can produce slightly “off” results due to ground vibration or temperature, automatic levels use compensators that stabilize the line of sight. This makes automatic transit levels a great choice for structural framework like foundations and floors as well as large-scale surveying on difficult terrain. Speed Line – A type of transit level beneficial for rough angle turning as well as fine tuning measurements. These levels may include clamps or tangents that stabilize the instrument and enable easy setup. Some models also include vertical arcs that work in conjunction with horizontal circles to help measure angles accurately. Universal – The kind of transit level designed for use on any type of horizontal or vertical sighting (e.g. localized building projects as well as large surveying or agricultural jobs). You should use transit level to determine straight lines and accurate measurement at the start of any major construction or surveying job. A transit level measures the exact distance of surface or target height over the visible line of a project. While some people assume you can just use global positioning systems (GPS) for surveying or forestry projects, transit levels are necessary for measuring the grade or slope in any hands-on construction or engineering task. Ensure the base has a stable surface. Line up the transit level telescope over the leveling screws to find your base positioning. Next, rotate your telescope 90 degrees until the instrument reads center. Once you have established this baseline, move the instrument through 360 degrees (in 90-degree increments) to begin leveling. Since different brands have additional features, refer to the user manual for specific details. Operation – While operating a transit level is relatively straightforward and safe, most brands recommend wearing gloves and finding a stable ground surface before you begin using the product. Safety – Keep your transit level in an identifiable case to prevent damage or breakage on construction sites. Storage – Most transit levels come with hard carrying cases for storage between use. These cases are essential for protecting the instrument from damage in rough construction environments. Between projects, store the tool in a cool, dry place away from direct sunlight. 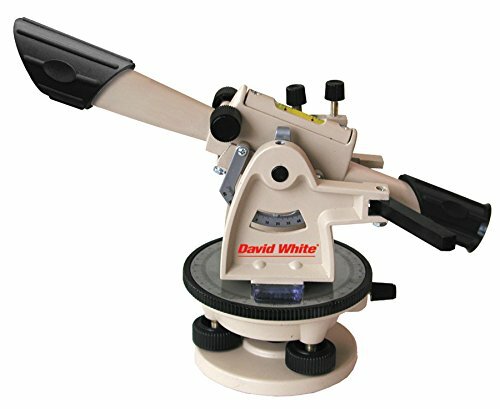 Product Features: David White LT6-900 is a precision tool suitable for both home improvement and large-scale surveyor jobs. This instrument has a 22x optical magnification for crisp, clear images at a distance of up to 200 feet (60 meters) away. The tool also has a leveling accuracy of 0.25 inches per 100 feet (or 6 millimeters for every 30 meters). David White LT6-900 has a horizontal circle with single-degree gradients with a horizontal lock and tangent screw for exact measurement control. The Verdict: Known for precision in movement, the David White LT6-900 is a great choice for handymen and women as well as professional surveyors. Product Features: The NWI NSLP500B is a classic layout tool for on-site construction jobs. It has a 20x magnification for easy-to-read images from up to 200 feet away. Along with this effective working range, the instrument has an accuracy range of 0.25 inches per 100 feet. With its tripod, plumb bob, and professional-grade aluminum rod, the transit level is a practical measuring tool for any location. The Verdict: The NWI NSLP500B is easy to use for most big, “on the site” construction projects. Construction professionals refer to this transit level as an industry staple for building jobs. Product Features: As a professional-stage transit level, the AdirPro is an automatic transit level designed to yield fast and accurate results. 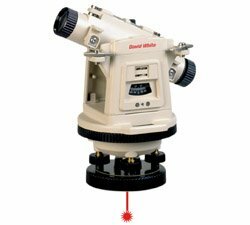 It provides clear 22x optical magnification in both horizontal and vertical directions with an accuracy of 0.25 inches per 100 feet. The AdirPro has a standard maximum working range of up to 200 feet away, but it also has a special 4.5 feet short-range focus to ensure precision on smaller projects. One of the most striking features of this leveling tool is the aircraft-grade aluminum telescope. The telescope’s achromatic-coated lens and built-in sunshade reduces light glare and sharpens the image (even when using the telescope at the highest magnification setting). With its sliding lock levels and aerodynamic design for mounting onto a tripod, you can easily use the telescope along with the transit level’s one-degree vertical arc to establish pitch and posts for any construction job. The Verdict: With its telescope, razor-sharp magnification, and horizontal-vertical applications, the AdirPro is a solid choice for professional jobs. Product Features: As the name implies, the NWI NCLP32 Contractor transit level is a popular choice for independent workers and contractors. It employs an automatic level with 32x optical magnification and an effective range of up to 400 feet, allowing you to work on large spaces with ease. 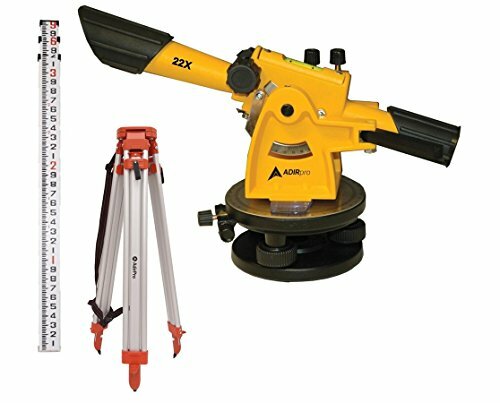 The instrument has an accuracy of 0.0625 per 250 feet, and the package includes a tripod and professional rod for accurate measurements on the job. In addition to its excellent magnification and working range, this tool comes with a hard case, plumb bob, and instruction manual. 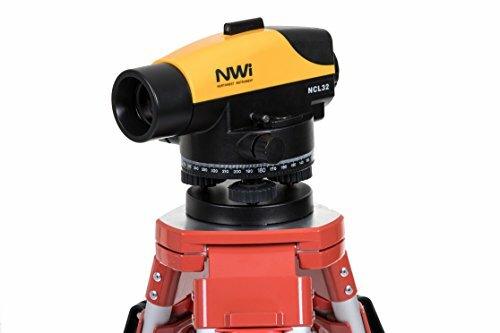 The Verdict: The broad, horizontal measurement capacity of the NWI NCLP32 makes this instrument a practical choice for general contractors. 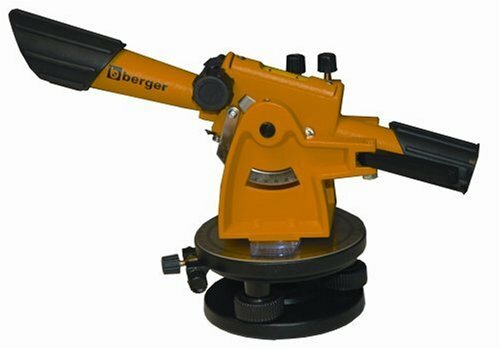 Product Features: The CST/Berger 54-200B is a unique product that can perform both horizontal (level) and vertical (plumb) measurements. This instrument can operate effectively at a distance of up to 200 feet, and it has an accuracy range of 0.25 inches for every 100 feet. Equipped with stadia and vernier, this product enables you to level the surface ground, formalize pitch, and then mark posts using the vertical measuring tool. You can also use the 15-minute circle to scope out rough angles. This tool is lightweight and easy to transport to your on-site location. The Verdict: The ability to perform leveling and plumb operation equally well make the CST/Berger 54-200B a must-have for most projects. Product Features: The David White LT8-300P Universal transit level is a rugged, sturdy tool suitable for everything from surveying to landscaping. This instrument has a working range of up to 400 feet (120 meters), and its leveling accuracy clocks in at 0.1875 at 150 feet. It has a horizontal circle and vertical arc that each have a lock and tangent to finalize pitch for work. In addition, this tool has an optical plummet attachment for visual accuracy. The Verdict: This model’s broad, universal application makes it a great choice for those who need a transit level that can function in any environment. Product Features: Contractors and laborers who need a compact instrument with cutting-edge technology may consider the David White 44-8872 LT8-300LP Universal transit level. It features a stocky design that holds a powerful 26x optical magnification lens for a crystal-clear picture. In addition, the leveling telescope has a laser plummet for easier upward usage. 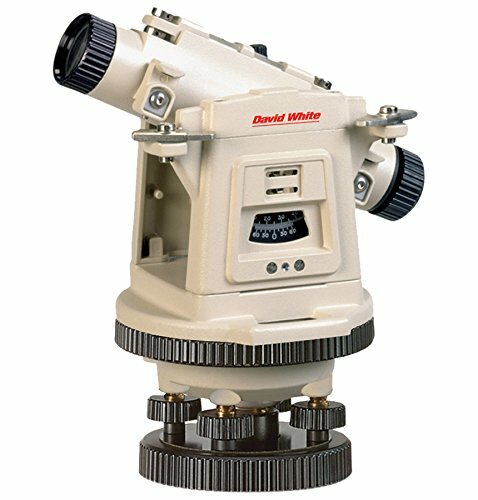 Like other David White transit levels, this model has an effective range of up to 400 feet (120 meters) and horizontal accuracy of 0.1875 at 150 feet. The product comes with a rain hood, plumb bob, lens cap, and portable carrying case for the job. The Verdict: For a compact, visually powerful tool great for distance measurements, the David White 44-8872 LT8-300LP is a popular option across multiple industries. 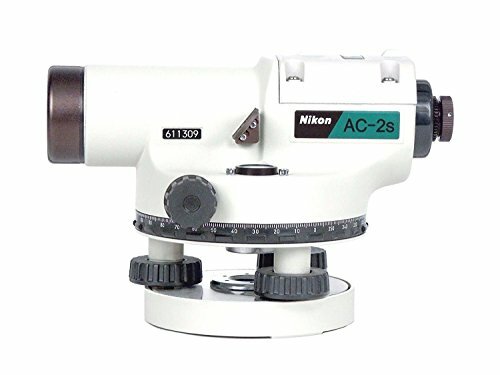 Product Features: If you need an automatic transit level that is truly lightweight and portable, the Nikon Ac-2S is a suitable model for you. Weighing only 2.8 pounds, this instrument provides optimal measurements for field jobs like surveying and forestry. This tool features durable metal outer shell with magnetic-dampened compensators that can withstand extreme weather conditions, making it perfect for leveling on diverse terrain. With a 24x optical magnification telescope, built-in bubble mirrors, and sighting lines, the Nikon Ac-2S can keep you feeling equipped in any environment. The Verdict: If you plan to work in extreme climates, tight spaces, or steep slopes, the Nikon Ac-2S Automatic is a practical tool for your supplies arsenal. 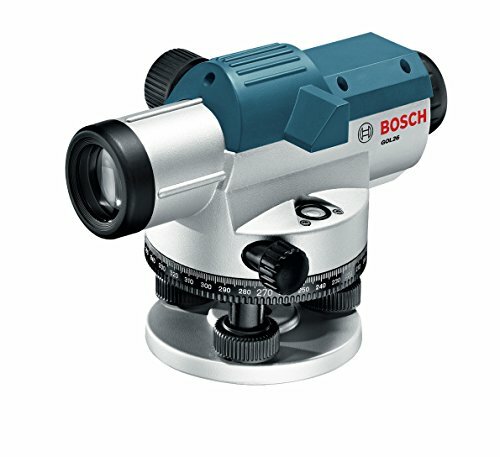 Product Features: The Bosch GOL26 is a compact automatic transit level that is as powerful as it is portable. It features a 26x optical magnification that allows you to work within a range of up to 330 feet. With an accuracy of 0.0625 inches per 100 feet along with horizontal and vertical crosshairs, this instrument allows you to take precise measurements in any location. Perfect for travel, the tool features UV-resistant housing and a self-leveling compensator that automatically locks into place during transport. Once you on-location, the transit level’s 90-degree prism enables quick setup and accurate alignment for your surveying needs. The Verdict: Laborers or independent contractors who travel for work can benefit from the travel-friendly design and generous working range of this tool.